(CBS/AP) Look out, chive lovers. Your favorite baked potato garnish might harbor dangerous germs. Chives produced by a New York company called Goodness Gardens have been recalled, the FDA announced, over fears they might be contaminated with Listeria monocytogenes bacteria. Eating food contaminated with the bacteria can trigger a serious infection called listeriosis, which causes fever, muscle aches, and diarrhea. In pregnant women - who are 20 times more likely to contract the disease - listeriosis can lead to miscarriage, stillbirth, premature delivery, or a life-threatening infection for the newborn. Others at heightened risk for listeriosis include people with cancer, diabetes, and kidney disease. People with AIDS are 300 times more likely to contract listeriosis than healthy individuals. The FDA says the chives were sold primarily by retailers in New York, New Jersey, Connecticut, Massachusetts, Pennsylvania, Maryland, Alabama, Illinois and Virginia. The Chives were distributed in plastic clamshell containers: 0.25 ounce (UPC 0 21985 20005 6), 2/3 ounce, (UPC 0 21985 10004 2), in 1-pound bags, and ½-ounce twist tie bunches. No other Goodness Gardens products were recalled. 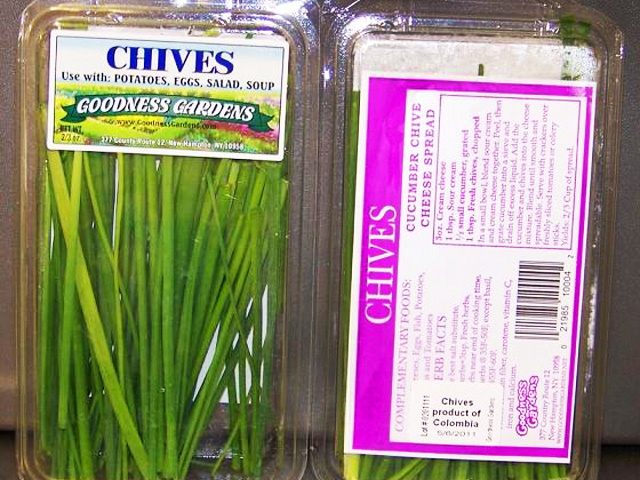 The FDA says no illnesses associated with the recalled chives have been reported. Consumers may return the chives to retailers for a refund. For more information, contact Goodness Gardens at 845-355-4757.